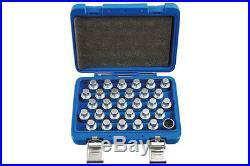 Genuine Laser Tools 6767 Locking Wheel Nut Key Set - Mercedes Benz 30pc. Locking wheel nut key set for Mercedes Benz Designed for garage or tyreshop use. Master locking nut key set designed for garage and tyreshop use. Supplied in a blow mould case for storage. This product has no reviews yet, however see what our buyers say about our other products.. DIY Car Service Parts has now added a dedicated sales and distribution team to handle customers questions and pre-sales enquires, we are experts in our field so if you have a query let us know! Unit 2 King Street Trading Estate Middlewich Cheshire CW10 9LF. The item "Genuine Laser Tools 6767 Locking Wheel Nut Key Set Mercedes Benz 30pc" is in sale since Saturday, June 24, 2017. This item is in the category "Vehicle Parts & Accessories\Automotive Tools & Supplies\Other Auto Tools & Supplies".